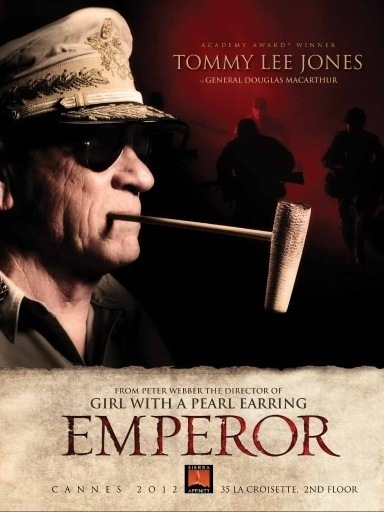 “Emperor,” starring Tommy Lee Jones and Matthew Fox, is about the early days of General Douglas MacArthur’s occupation of defeated Japan. Jones is the imperious, brilliant general, and Fox is his subordinate, General Bonner Fellers, tasked to determine quickly whether Emperor Hirohito is a war criminal. The movie is entertaining and approximately accurate historically. MacArthur intuitively knew that U.S. occupation would be simpler with the Emperor than without. In the end, of course, Hirohito is spared, having been found to be mostly a passive bystander manipulated by the governing militarists. His role at the end in demanding surrender, when much of his government preferred to wage national suicide, even after two nuclear strikes, was admirable. The movie portrays the often forgotten attempted military coup against him. 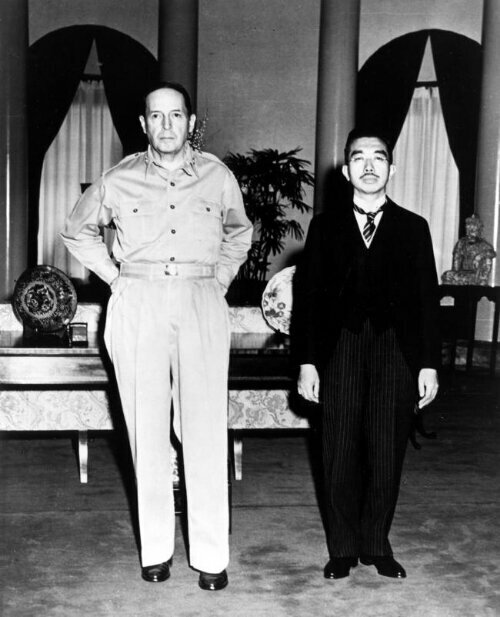 A final scene dramatizes MacArthur’s famous meeting with the Emperor, captured by an iconic photo, showing the American general towering over the short monarch. Fox’s character is based on an actual MacArthur confidant who later helped found the ultra right wing John Birch Society. Probably not many Birchers get such favorable Hollywood treatment. The movie does describe him as sharing MacArthur’s “phobia” about Communism. By all accounts, MacArthur’s occupation masterfully created a new, democratic, prosperous, peaceful and pro-American Japan. He disestablished Shinto as Japan’s official religion, and the Emperor was forced to renounce his deity. Several years ago a new book revealed that MacArthur had thought Japan was briefly ripe for Christianity. As MacArthur himself described in a mid 1950s interview, he had invited thousands of U.S. missionaries to post war Japan. Most didn’t speak Japanese, and the effort largely failed. Only a tiny minority in Japan is Christian, contrasting with dramatic Christian growth throughout most of Asia. Reputedly, there was even consideration of the Emperor’s becoming Christian. According to lore, the U. S. did not encourage conversion because of political complications over whether Hirohito would become Protestant or Catholic. 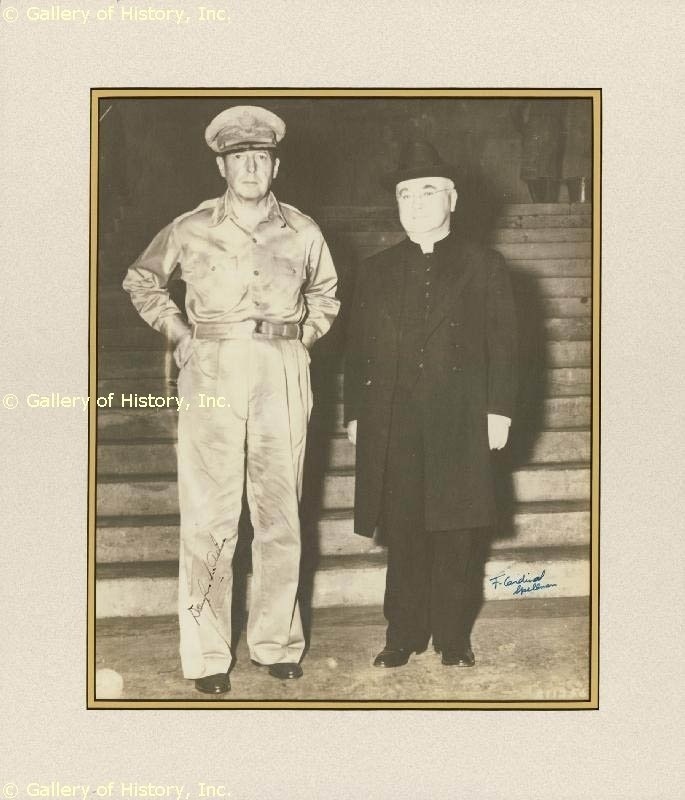 MacArthur invited both Catholic and Protestant missionaries, even soliciting help from New York’s Cardinal Spellman. MacArthur, an Episcopalian, was sometimes an outspoken Christian though seemingly an often indifferent churchman who preferred working in his office to worship on Sundays. After he conquered Seoul from the North Koreans, he led the South Korean parliament, which presumably was mostly non Christian, in reciting the Lord’s Prayer. South Korea’s founding president, Singman Rhee, was famously Methodist and sometimes attended Foundry Methodist Church when in Washington, DC. In retirement, MacArthur and his wife attended majestic St. Bartholomew’s Episcopal Church in Manhattan. Episcopal clergy and bishops presided over his funeral services in New York and Norfolk, Virginia. At his service in the U.S. Capitol Rotunda, the longest serving U.S. Senate chaplain, Frederick Browning Harris, also longtime pastor of Foundry Methodist, delivered the eulogy. Of course, the movie shows no religious aspects to the occupation of Japan, in keeping with Hollywood policy of usually ignoring faith. But all human stories are ultimately spiritual, and MacArthur and the occupation of Japan are no exception. To Donnie, You are correct in your reading of my inference. My point was to suggest that Japan already had it’s religious faith/beliefs, and I think it would be presumptuous to think by “conquering” a foreign country we should expect to ensconce our religious beliefs upon them. Isn’t defeating one’s enemy enough? Why insult them further by trying to take away their religion? And Benmwelliver.. I was raised Methodist and every Sunday (morning AND evening) and Wednesday nights, I would be made to hear all that the faith had to offer. I made some life-long friends during those moments, that I’ll cherish forever. I do remember the passage: “Go ye into all the world, and preach the Gospel…” and that makes sense for any group that wants more parishioners, as you so well stated. I just think it’s like any salesperson, one shouldn’t expect to make a “sale” with every sales-pitch. Some people just don’t want (or need) what you’re selling. Christianity isn’t for everyone. I like the term you used: ‘Theo-Liberal’ and I shall quote you forever more. The fact that (we) Liberals wish to include people of the full human spectrum doesn’t preclude us from ministering God’s message. We’ll just have more joy in our hearts knowing that we hold no prejudices about variations in the human condition. Thank you for your responses, gentlemen. Since, in the liberal theology, everyone is going to be saved anyway (even Hitler, right? ), what exactly does “ministering God’s message” involve? Obviously not evangelism, which you find odious. Is taking the Left side in any cultural or political debate the core of Christianity? What really does “salvation” mean in the liberal theology? Feeling all woozy when you look at the Grand Canyon? For the life of me, if the liberal religion is true, then there is really no reason for those churches to exist, I mean, other than to give all those lazy and Politically Correct seminary grads some gainful employment when they aren’t ringing doorbells for the Democratic party. J. Gresham Machen wrote the classic Christianity and Liberalism, describing them as two different religions, two different worldviews. he was not only astute, but prophetic. I don’t think he’d be shocked that churches calling themselves “Christian” would engage in such anti-Christian political activism. I saw the movie, and I would disagree, as to your sense that the movie completely neglects the religious and spiritual aspects of the occupation of Japan. Did you miss the pivotal scenes in the movie where Gen. Bonner prays at the shrine of his lost love, lighting a candle there, also showing a lot of love and reverence for her ancestors? Of course, I realize that this kind of “enlightened” thinking and cross-cultural inclusiveness on the part of a senior military leader of the occupying forces might well be a big fabrication on Hollywood’s part, the better to emphasize the story of a general’s courageous respect for the old Japanese ways, and a willingness to disregard the historical reality of how negatively the occupying forces were actually disposed towards Japanese religion at the time: I just don’t know. But the movie did depict “faith” in a positive light, if not Christianity. Imagine how intrusive and insulting it would have been to even expect Japan to consider converting to Christianity immediately after being ‘conquered’ by the US? That kind of insensitive bravado could only come from a religion that thinks IT has the only answers to knowing “God”. I certainly don’t think the movie would have been any better, had they mentioned more about General MacArthur’s faith. Maybe I’m misreading you, but are you claiming there are other ways to God other than Christianity and other than through Jesus? Donnie, the one core belief of theo-liberals is that there is nothing special about Christianity, in fact they are embarrassed by it, and they see it as sinful to engage in evangelism or missions. They claim that Jesus’ Great Commission in Matthew 28 (“Go and make disciples”) was not an authentic saying of Jesus. Not having any real faith in their faith is the reason their churches are half-empty. When you don’t believe in making disciples, then – surprise! – you don’t make any. I sometimes get a little cynical and wonder if their push to bring more gays and lesbians into their churches is a desperate measure to try to stop the membership loss. Liberals aren’t having many children of their own (good! ), and their kids usually drop out of church anyway, and they’re certainly not making any new Christian disciples so they have to try to fill up the pews with groups they call “marginalized.” The numbers indicate it isn’t working out all that well.